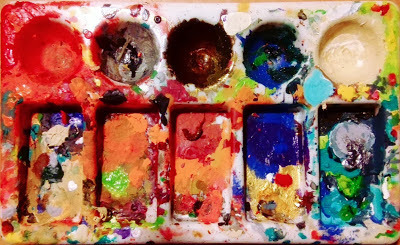 I don't know what's happened but my momentum has seriously stalled practically as soon as I wrote my 'what's on my pallette' post. 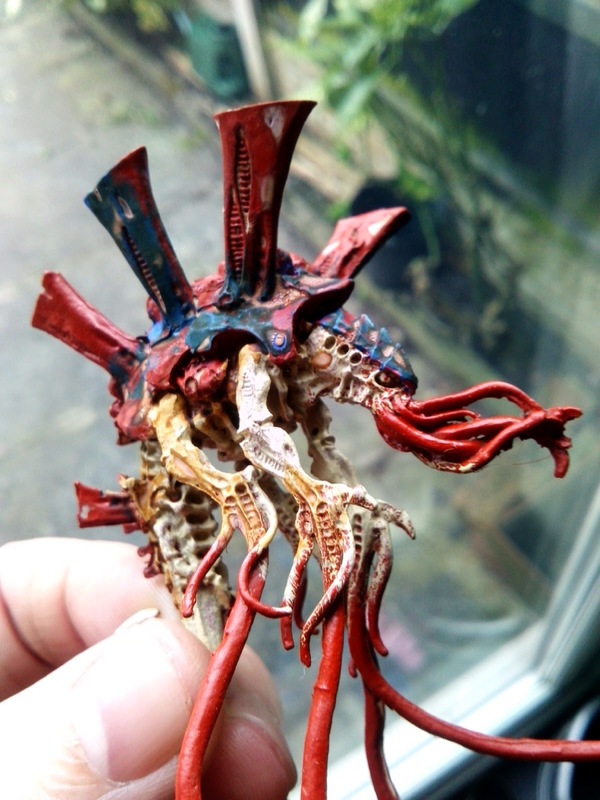 I've tried to do more nids, much to my own disgust, in an attempt to kickstart my motivation. 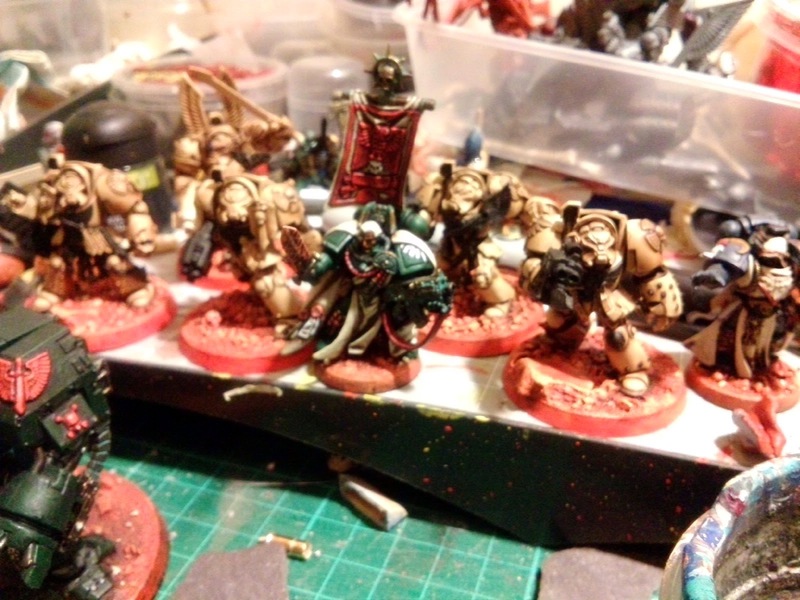 I've done little bits but it's all the metallics on the Dark Angels that I can't bring myself to start, so I went bug. 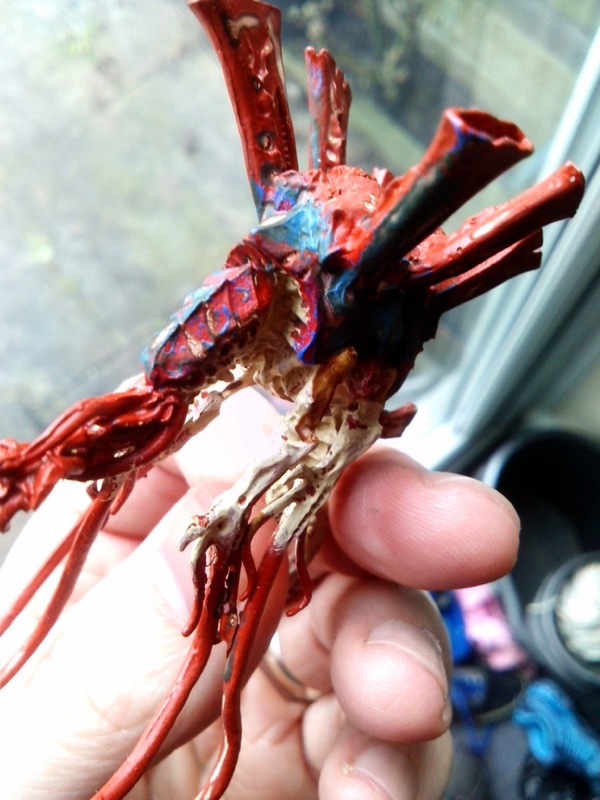 The problems continued as you can see on my Venomthrope - the blue paint just won't stick to the Red Oxide Primer! So you can see I tried to create some sort of 'key' for it to stick to, using a product I already know adds a fine texture - Seraphim Sepia - hence all the powder smudges where it's gone all chalky. Nothing like being able to guarantee a failure of product and therefore use it to your advantage instead of it ruining your model. I've since added some more blue on top and it's 90% covered now, whether that's to do with the Sepia I don't know but the problems haven't helped me progress. 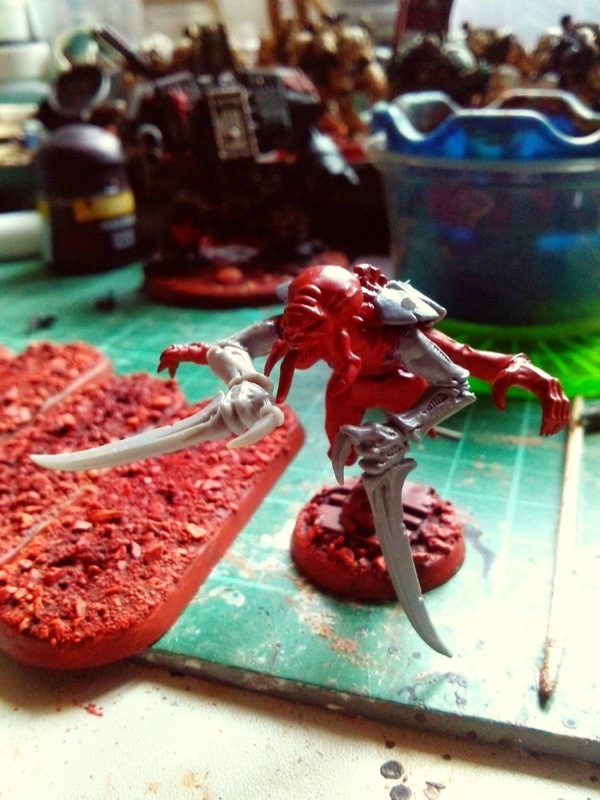 I also went completely off-piste and started my Carnifex, it's been magnetized but I still need to resolve what to do in his spare limb sockets. 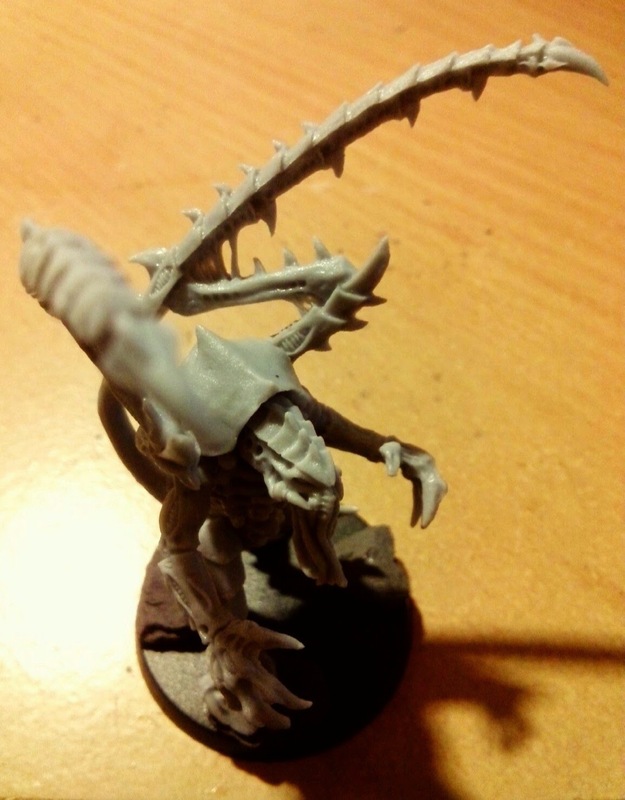 I've done the Felshborer Hives as twin linked Devourers and they're polarized so I can use them on the Great Maw too. But when you use them you still have those spare sockets. 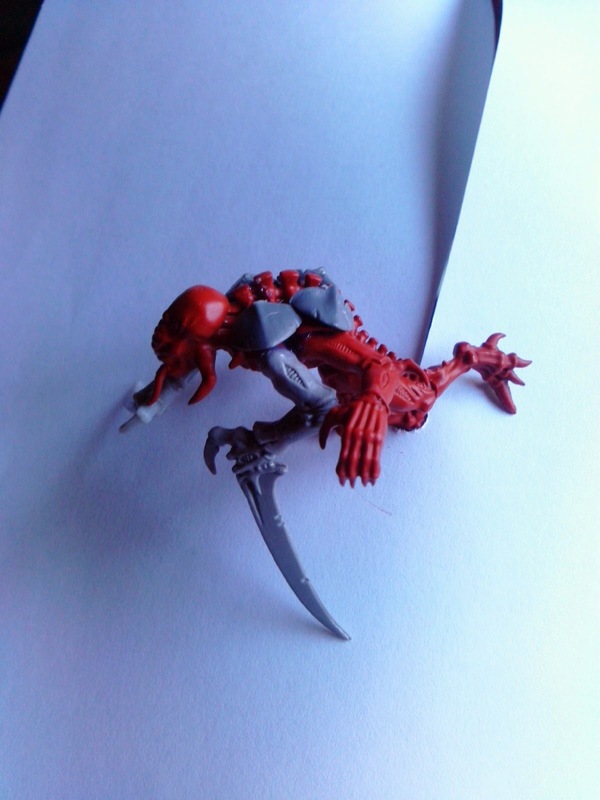 I'm doing some Mawloc Claws for feeble combat weapons and may do an alternative of Venom Cannon sacks but need to model the right hand sack as they're all lefties, or 'sinister' as they're officially known in our house! I also had a game with PeteB and took what I thought was a really 'dirty' list - two Punisher Vengeance Weapon Batteries, Flyrant, 2 Tervigons, 60 Termagants a Mawloc, Hive Guard and Biovore. 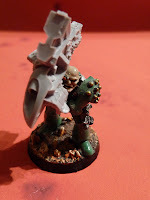 I even proxied my spare Tyrant as a Dakkafex to see what would happen. PeteB's Wraithguard/Lord and WraithSeer [Avatar proxy] heavy list seemed like it was outmatched against all my Monstrous Creatures. I got hammered though, the mawloc mishapped [and died] when it failed to take down even one of his three War Walkers when they outflanked. Much of my dice rolling was appalling, though PeteB was equally stuck with turns of little significance. Ultimately though his force was just more durable with plenty of FnP being passed amongst his Wraithguard. The Dakkafex met an thoroughly ignominious end, charging a Wraithlord and getting killed before it could even try and hit it! 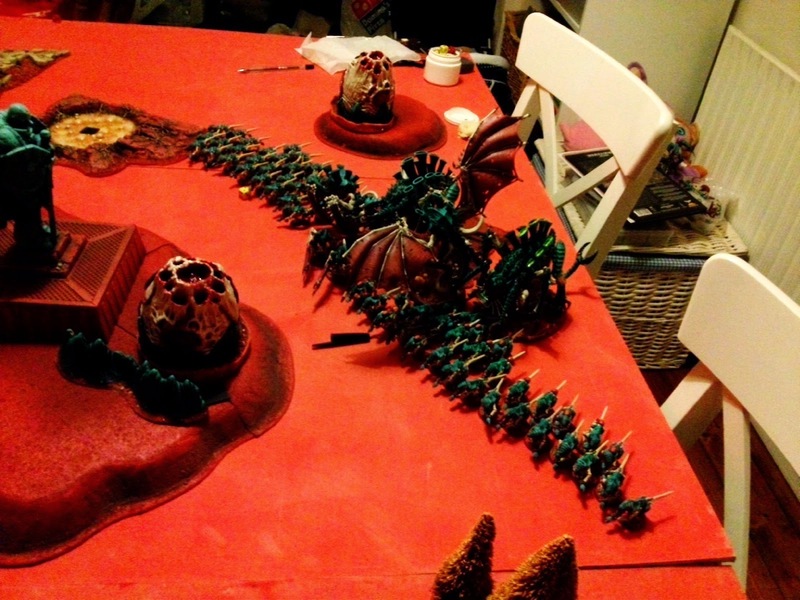 It was a good game but another reminder that the Tyranid Codex is a fickle beast. It can work but even what I would consider a 'dirty' list can roll over and die at a moments notice. PeteB was equally shocked, particularly with 'prowess' of the Dakkafex! So it was a bit of an anti-climax and its a reminder that despite the effort put into painiting there's no guarantee the figures will perform. Once you add in the very slow progress, the array of hurdles that are obstructing the slow progress it's taken most of my momentum away. The knock on effect is I've not much 'progress' content for the blog and that's making me less inspired to write, which is a shame as I've had a number of new followers join and I really do owe it to you all to keep standards up. I've actually been thinking about experimenting with Twitter and seeing if I can link the accounts so I can tweet some updates. I've mentioned before I need to learn the skill of 'micro-blogging', long posts are OK, but short and sweet are also useful, I just struggle keeping things brief. Twitter forces you to be brief and social media is something I need to get a firmer grasp of because I've applied fo a temporary promotion in my job which is less design [boo] but more customer engagement [yay]. I think we need to be more customer focused and embrace social media a bit more. The good thing is even with my limited experience I think I'm one of the 'sharper tools in the box' heading into this, but if anyone has experience of using Twitter and integrating it with their blogging,or building I'd be interested in any advice, both for 40kaddict and my wider experience. 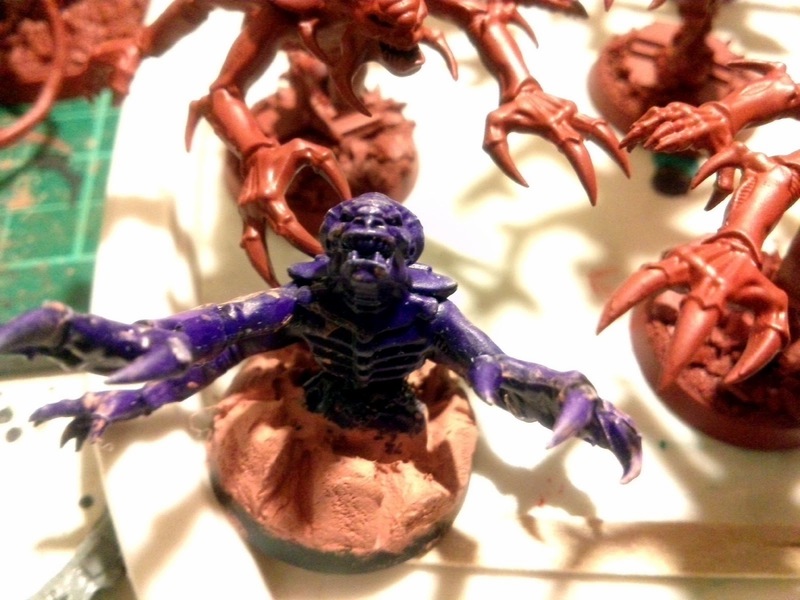 As I said in my 'what's on my palette' update I've been adding in soem extra Genestealers while painting. This Stealers kitbash was post-priming and basing so I needed to find a way to prime his arms without doing the base again. 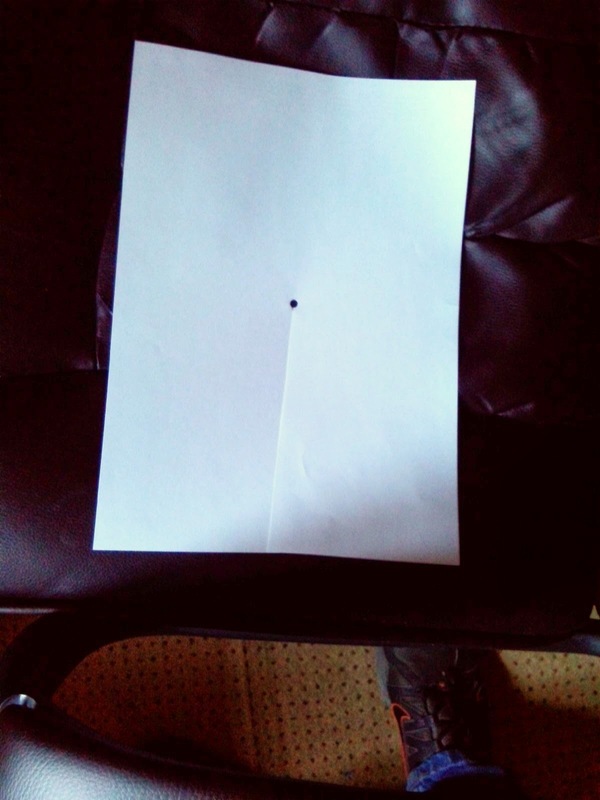 So I got a sheet of A4 paper, cut a line halfway up and used a hole punch at the end. This then allowed me to simply mask off the base from the rest of the model. And primed without needing to paint the base again, simples! Here's the rest of the Stealers. In particular this fella, he came broken, just at the ankle so I liked the idea of still showing it rising from dormancy, like a Ymgarl stealer. It also added a little variety to the brood. 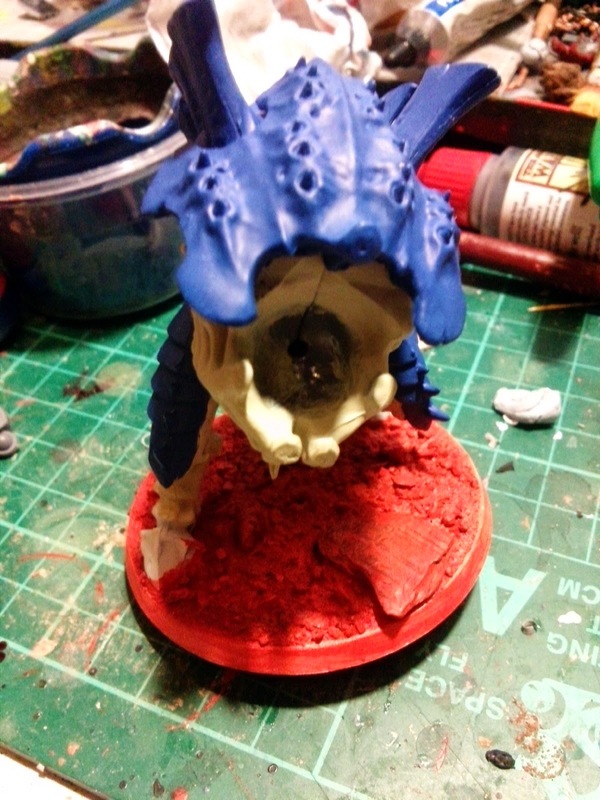 He's since had some sand added to the base and his back to show it falling off him as he bursts from the ground. 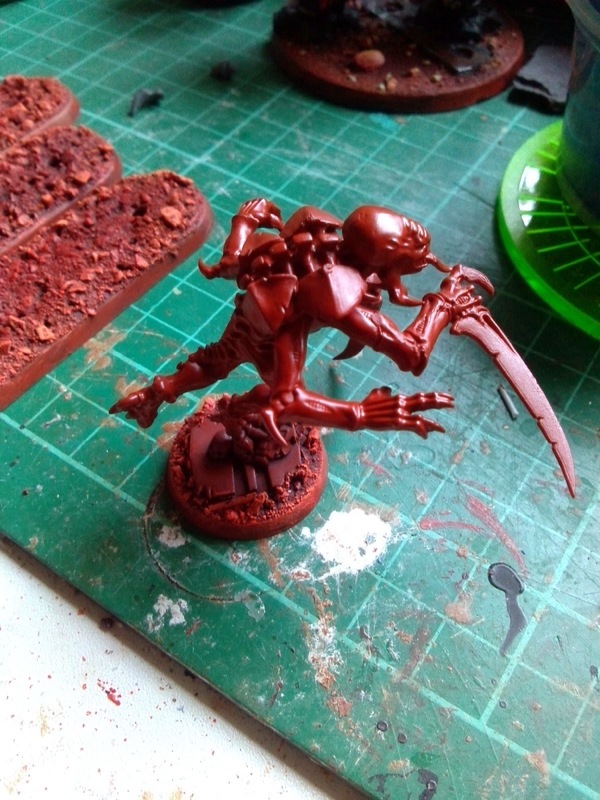 I've painted 5 stealers bonewhite so far, I'm trying to be careful so the red oxide primer can be sued for the fleshy bits but this process is slowing the base coat down and making it tedious so I'm only doing three models at a time to preserve my sanity. 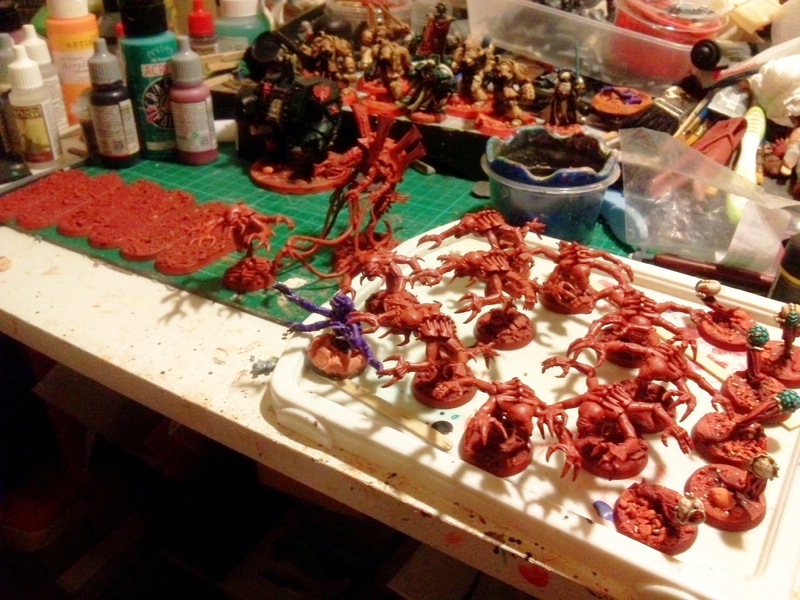 That way it also feels like I'm not devoting all my efforts to nids when it should be on Dark Angels. Only four[ish] weeks since my last confession, but I've spent most of that time blogging about Throne of Skulls, when you spend half a year leading up to a single event I think the extra coverage is somewhat justified. Given most of that coverage is 'historical' I thought it appropriate to bring oyu all right up to date with what I was doing now, particularly as that post Thrones lack of motivation hasn't materialised, well not as such. 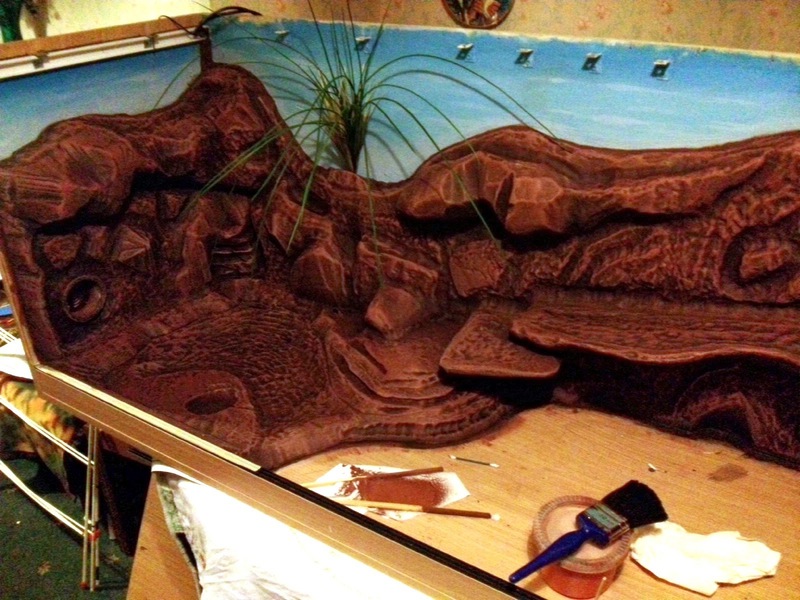 First up I did as promised and helped finish my brother's vivarium of I can't work out if it's any better than last time but really it's a pointless debate as this is the way it stands now and so long as he can get a decent varnish that won't mess it all up it's done. Here's the previous version, difficult to tell if it was better given the different lighting. 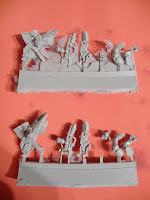 But I've also started on my Dark Angels, admittedly this is only six bike bases but I took 3 of the Dark Vengeance bikers and started to add Tin Bitz where the metal was. Once again I'm going brassy/bronzey to tie it all in. If the company colours don't match at least the metals and bases will. The DV bikes will be a little more straightforward than my other Ravenwing ones which still require some modelling work and I have to pin the bases properly which currently is a stumbling block to progress. 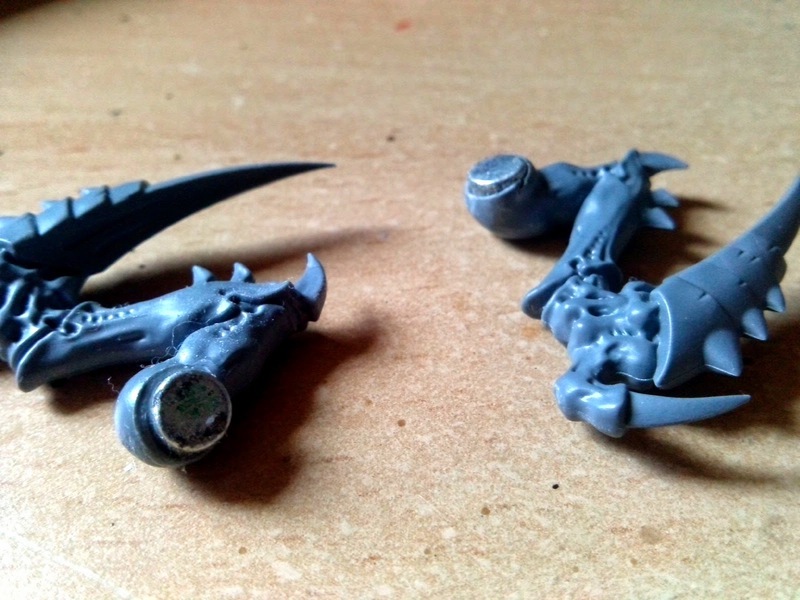 I also added Tin Bitz to my VD Deathwing, so they're progressing, if glacially so. I've also started work on Brother Cask again. Here he is 'as was' but I since decided I could afford to add some green highlights and I'm happier for it. I realised he's a quick win for me, he's nearly complete, especially now most of the highlights are in place. I just need to add some additional effects and all the litany markingsand he'll be playable. The only other thing I want to do on him and the Ravewning is to add some red planet dust weathering on his legs. I still need to buy it though so I'll probably get him finished and then weather at a later date. I've also got all my Devastators stripped and primed. Unlike the Dreadnought which ultimatle may not be a regular feature in my army the Devs will so they need to be done. Additionally I have my Typhoon Land Speeder primed and ready to be painted alongside my bikers. 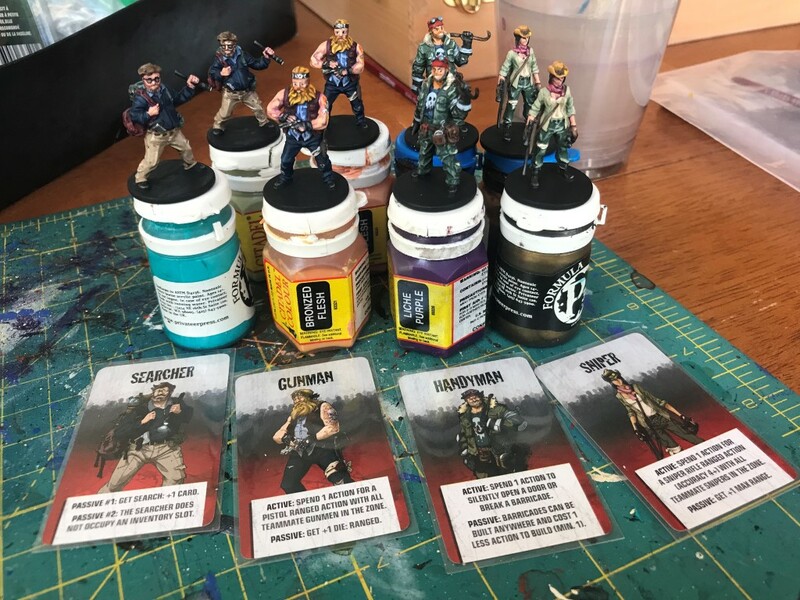 Now I know I'm, not supposed to but I also have 11 genestealers primed and as and when I feel like it I'll be dipping into these. 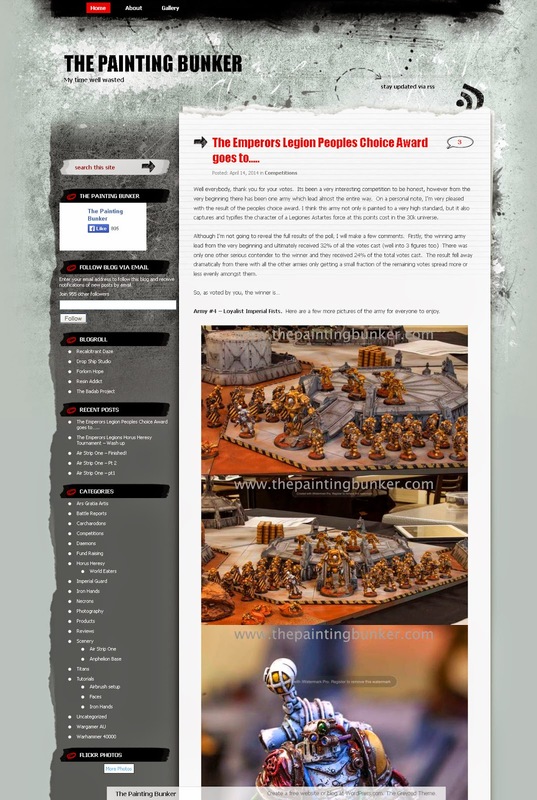 I want to try and run the Genestealer data slates. They offer First Blood up on a silver platter but I quite fancy running both in a game. 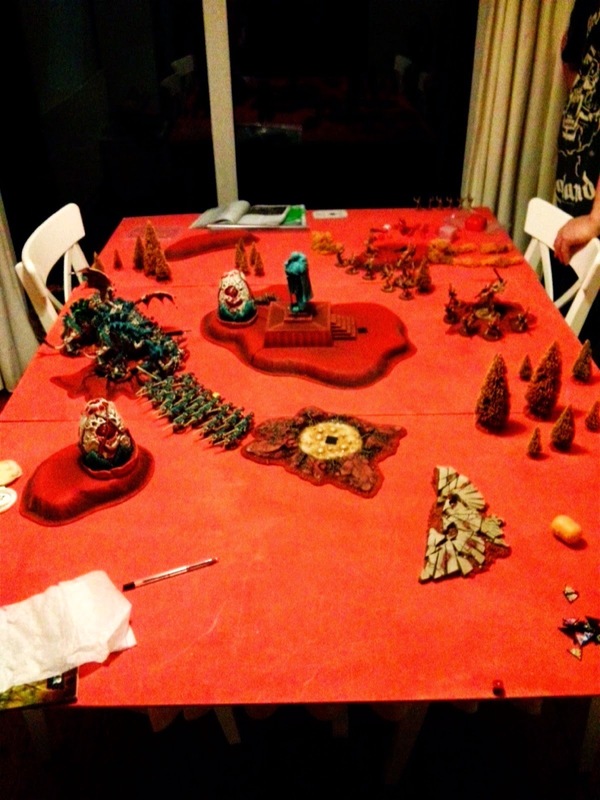 Five broods of five, plus three large broods with a Broodlord in tow right in your opponents face. You have to deal with that ahead of all the other things crossing the battlefield. I may even consider dropping some of my Fortifications to manage it, but to do so these 11 Stealers need to be added to my current group. This one is from Space Hulk and I added some Warrior ScyTals because they looked so cool on Otty's version. They look a little weird but they were added to the arms exisiting poses, looks like a knife fighter. I've also got my Venomthrope primed and ready to go. If I'm going to drop a Fortification I'll take my cover with me. And I also found time to break out the old Aegis I won at Blog Wars. The walls have been removed from the sprue and the Quad gun has mostly been built but I'll probably have to paint it in pieces for simplicity. I still need to decide on paint scheme. 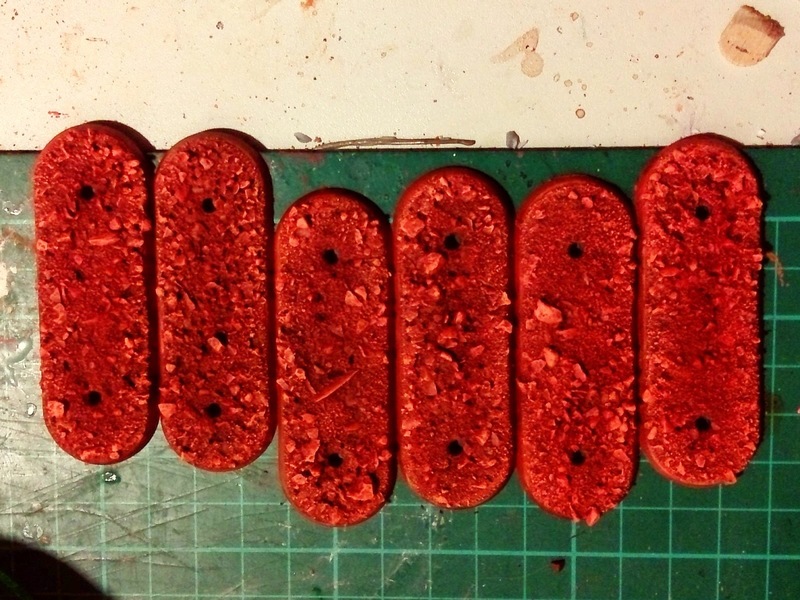 Do I go green to match the Dark Angels or red to match the rockcrete of Ferron Proxima. I want to do the latter but given my tro of colours anyway - green, black, bone does a large swathe of red just make it even less cohesive? I know I can do the red justice, the Reaver Titan and all my other red planet efforst prove this but as a whole, does the theme run true or will it just look a confused mess? That looks like a lot doesn't it, and it probably is and I'm still super stoked and motivated despite the hobby glut from Thrones. But, my evenings have been slightly more social recently, spending time with the family and I'm going in earlier to work but not going to bed any earlier. this leaves me with around an hour to 90mins of hobby to which I then faff about until after midnight. I'm still pleased I'm doing stuff but it's only because I have this sensation of where I want to be with it - completed figures. How long I can sustain that source of momentum is anyone's guess. Additionally with all the Thrones content I had quite a catalogue of scheduled posts but they seem to have all been used up and although I have a host of posts I'd like to do and can imagine them all pretty and published they're taking up further hobby time because I can't seem to learn to type less, he says looking back on the 1,000 word post he's just written. Seriously did you all read all this stuff! Probably not and I know a bit of brevity might called for, it'd help you as readers and me as a blogger but the compulsion to just put it all on the page is just another part of the addiction. Sorry folks, I'll try harder though to keep it short and sweet. 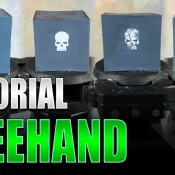 Anyway, loads to come, just need to find a way to record it quickly and efficiently. "What's App Doc?" 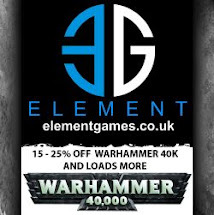 3 - Yet another upcoming 40k game! 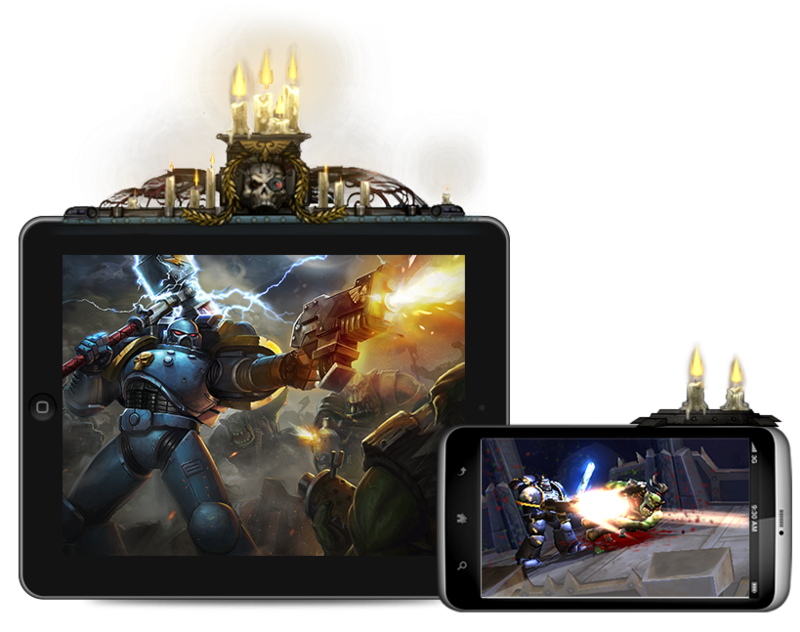 Yet another 40k game and this one looks a lot better than that 'lane strategy' effort, check it out here: http://playcarnage.com/ it's due for release in May on both iDevices and Android. I do get a bit 'snap-happy' at these gigs but there's a lot to see and I have to make sure I'm feeding your hobby addiction as well as my own. 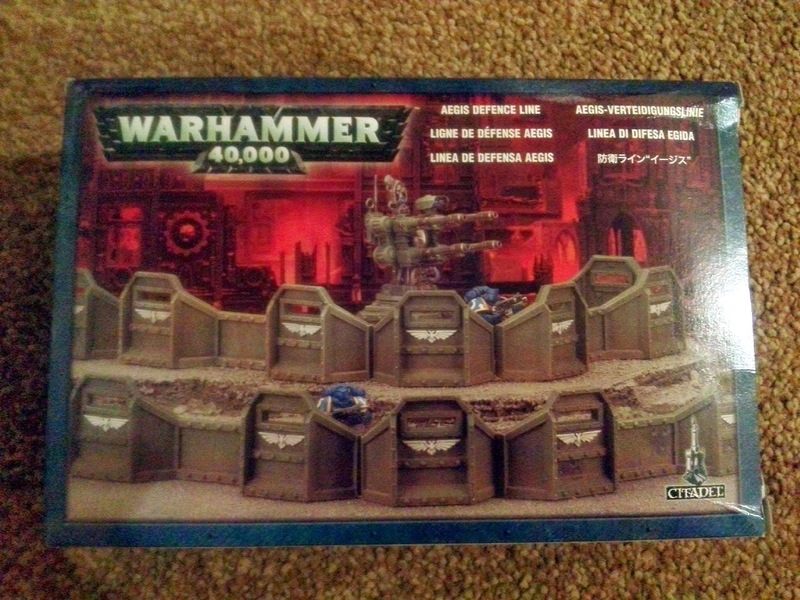 Firstly some Warhammer World Terrain pieces, I think these would have been better served on the actual tables, PeteB pointed out the lack of terrain in some of those games. Tyranid Carnivorous plants, made from Trygon Prime crests and green stuff. I saw these on the old WW Facebook page prior to painting, glad to see them finally finished. Chaos Shrine. that's a big piece of skin. A cool Skaven mutant and the Throne of Skulls Winner's Trophy, which could have been Liam's! 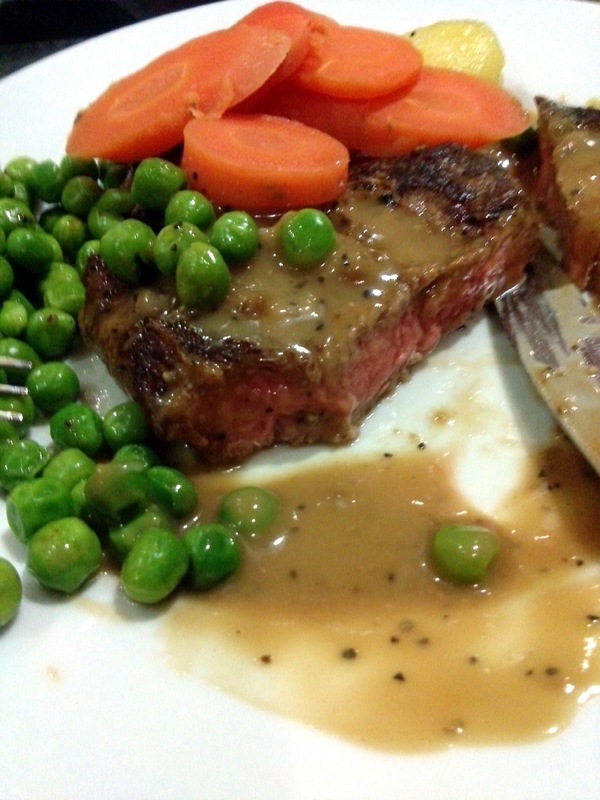 Saturday tea, steak anyone? 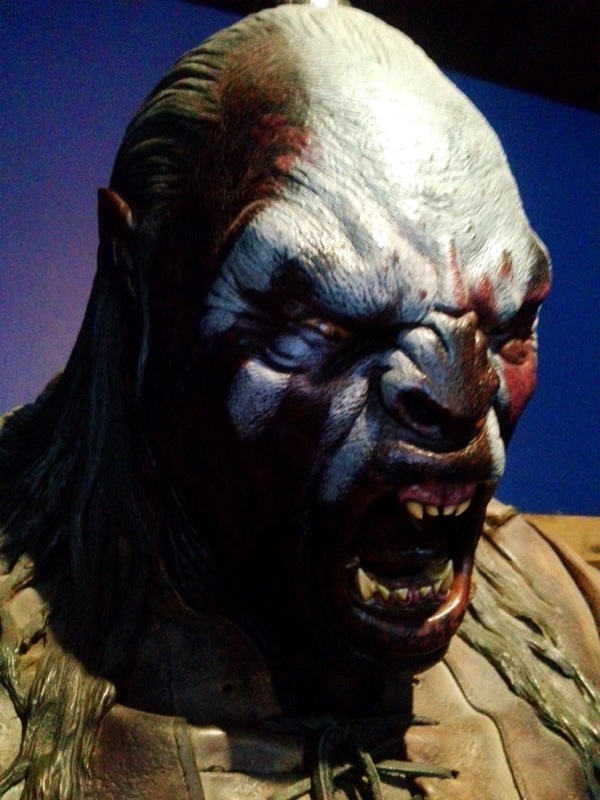 Uruk Hai! 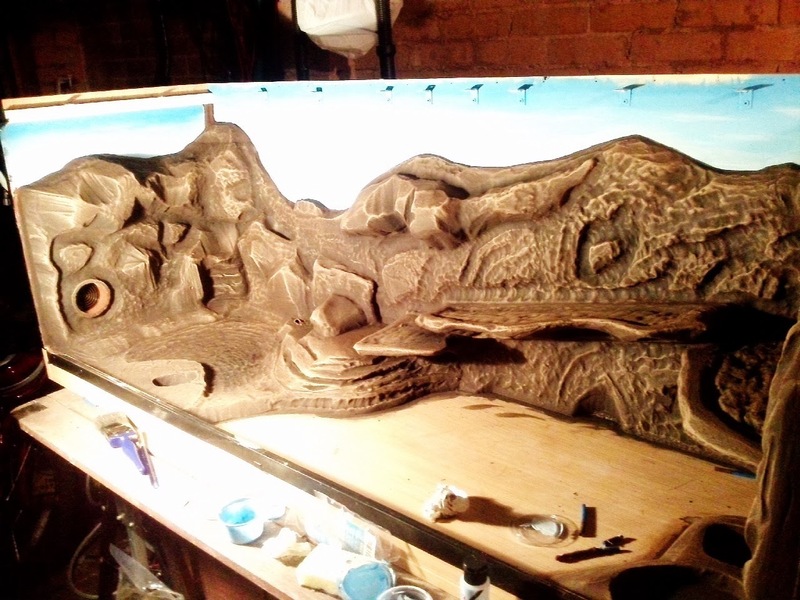 Some actual pieces of Terrain follow, just to get texture that I may put on future Terrain pieces. A massive selection of pics of the GW Imperial Knights, feast your eyes. 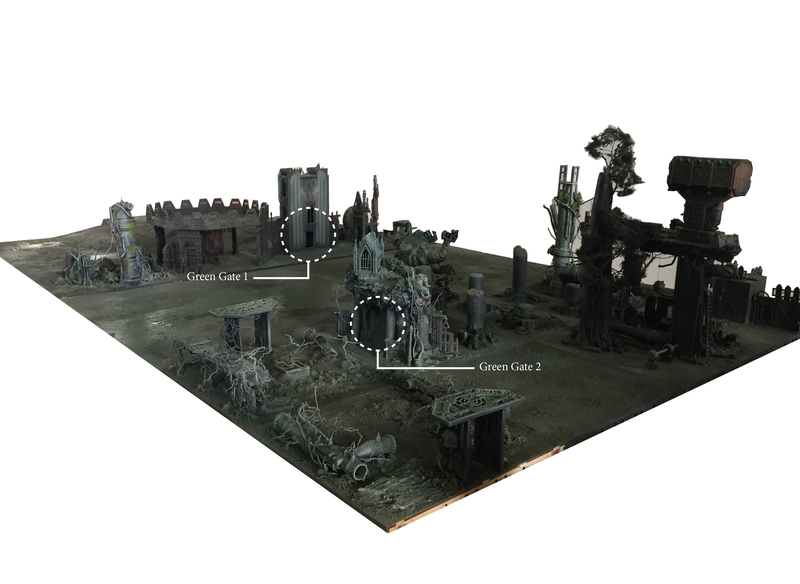 Eddie Eccles' won the Armies on Parade for GW staff. Personally I think the individual display would have been better served for the public winner, so you could get behind but I understand why it's together with the silver and bronze winners. Some interesting Dark Angel Ravenwing. 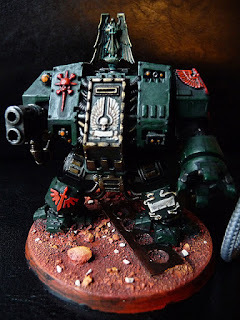 Lastly a Contemptor, I think I want one of these, eventually. Must finish my current Dark Angels first though.